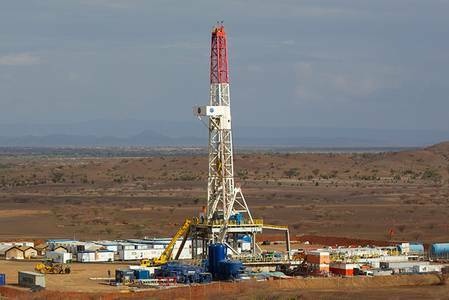 Africa-focused Tullow Oil expects the first crude shipments from its Kenyan oilfields in the first half of 2019 and is pricing the product for the market, the company's chief executive said on Tuesday. Paul McDade also told Reuters that Tullow, which has expanded beyond Africa to the coast of Guyana, was bringing forward its drilling plans for the South American country and was looking to drill at least two wells there in the middle of 2019. In Kenya, one of Africa's newest oil plays where Tullow is already trucking crude, the next phase is getting ready to roll. "We will have a shipment of Kenyan crude ready to go probably in the first or second quarter of next year. We will market that and it allows the refiners to see the crude and try the crude so that helps the marketing process," McDade told Reuters on the sidelines of the Africa Oil Week conference. The price for crude from Kenya and neighboring Uganda has not yet been fixed. The product is light crude but is waxy, a drawback as it needs to be heated for transport to stay liquid. But its extremely low sulphur content is a plus. A 0.5 percent sulphur limit will be imposed on marine fuels from 2020 by the International Maritime Organization, down from 3.5 percent, to help protect the ocean environment. "It is as close as you can get to zero sulphur which is quite unusual. That will give it a premium," McDade said. He would not be drawn on what he thought its price ultimately would be in relation to the Brent benchmark. Tullow also has a planned pipeline project in Kenya and its CEO said tenders would go out for that probably in the first half of next year. Some of the contractors Tullow has spoken to have said they can get their own financing. "That is a novelty, it's not the conventional way to go," McDade said. Meanwhile, in Guyana, Tullow has accelerated drilling plans in its concessions. "We had originally thought we would drill some of those wells late next year but we have now accelerated and will probably drill at least two wells in our block around the middle of the year," McDade said.